Russian Threat To Elections To Persist Through 2018, Spy Bosses Warn Congress Moscow's interference in the United States and the West has continued since 2016 and is forecast to persist through this year's midterm races, the U.S. intelligence community says. FBI Director Christopher Wray (from left), CIA Director Mike Pompeo, Director of National Intelligence Dan Coats, Defense Intelligence Agency Director Lt. Gen. Robert Ashley, NSA Director Adm. Michael Rogers and National Geospatial-Intelligence Agency Director Robert Cardillo testify before the Senate intelligence committee on Tuesday. Russian influence operations in the United States will continue through this year's midterm elections and beyond, the nation's top spies warned Congress on Tuesday. "There should be no doubt that Russia perceived that its past efforts as successful and views the 2018 U.S. midterm elections as a potential target for Russian midterm operations," Coats said. 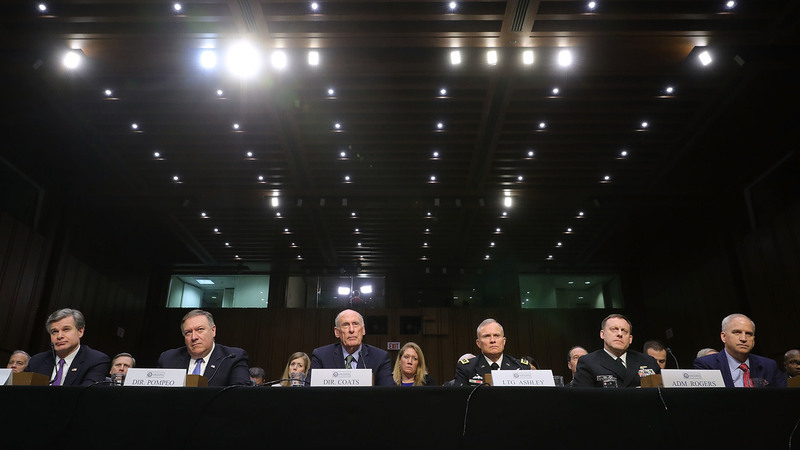 The top intelligence officials in America were on Capitol Hill Tuesday because the Senate Select Committee on Intelligence convened its annual hearing on "worldwide threats." The hearing takes place every year, but this year's installment convened amid an ongoing Department of Justice and FBI counterintelligence investigation into whether President Trump's campaign might have conspired with the Russians who attacked the 2016 election. It also followed reports about the losses of U.S. agents overseas, the theft of the NSA's secret spying software and other major setbacks in the intelligence business. More broadly, the world itself is also getting more dangerous, as senators heard. "The risk of inter-state conflict is higher than any time since the Cold War," Coats told senators in his opening statement. Along with Coats, also answering questions from lawmakers were CIA Director Mike Pompeo, FBI Director Christopher Wray and National Security Agency Director Adm. Mike Rogers, as well as the heads of the Defense Intelligence Agency and National Geospatial-Intelligence Agency, Lt. Gen. Robert Ashley and Robert Cardillo, respectively. The intelligence bosses were asked to restate their support for the 2017 report that concluded Russia had waged a campaign of what spies call "active measures" against the 2016 election. All of them did. President Trump goes back and forth about whether he accepts there was such an attack or whether it was a "hoax" waged by sore-loser Democrats. Sen. Angus King, I-Maine, said he was frustrated at trying to warn his constituents about the threat from foreign interference when voters were able to point to Trump's comments and question whether it was actually happening. But lawmakers on both sides of the aisle, as well as the intelligence officials, spoke to the importance of at least speaking clearly about the Russian threat, even as the issue of whether the president's campaign colluded with the Russians remains an open question under investigation by DOJ special counsel Robert Mueller. "We need to inform the American public that this is real, that this is going to be happening, and the resilience needed for us to stand up and say we're not going to allow some Russian to tell us how to vote, how we ought to run our country," Coats said, in response to questions from Sen. Susan Collins, R-Maine. "I think there needs to be a national cry for that." Members of the Senate committee differed on how well they thought the United States is preparing for continued influence operations against the democratic process. Vice Chairman Mark Warner, D-Va., said he was frustrated by what he called a lack of action and a lack of coordination inside the intelligence agencies. "We've had more than a year to get our act together and address the threat posed by Russia and implement a strategy to deter further attacks," Warner said. "But I believe we still don't have a comprehensive plan." Sen. Jim Risch, R-Idaho, on the other hand, said extensive discussions in Congress and in the press since 2016 meant that Americans now know better what to expect. "I think the American people are ready for this," Risch said. "I think they're going to look askance a lot more at the information attempting to be passed out through social media." Facebook and Twitter and other online platforms have become key conduits for disinformation that originates in Russia and attempts to amplify political division between Americans. Pompeo used part of the hearing to try to correct the record. He faulted stories in the New York Times and The Intercept last week that said American intelligence officials paid $100,000 to a "shadowy Russian" in an effort to get back stolen National Security Agency cyberweapons. Not only did American spies want to recover stolen secrets but they also were offered material described as compromising about Trump, according to the stories. That didn't happen, the CIA director said. "Reporting on this matter has been atrocious, it's been ridiculous, it's been totally inaccurate," Pompeo said, adding that the CIA did not "provide any resources, no money" for what he called "phony information." There was no information as to whether another intelligence agency or government department might have paid to try to recover the NSA material. The Senate committee also discussed the nuclear missile threat from North Korea and the "instability," as Coats described it, of that country's leader, Kim Jong Un. North Korea staged a massive military parade last week, showcasing its tanks and missiles, ahead of the Winter Olympics' opening ceremony in South Korea. It also has sent a contingent of athletes and cheerleaders to the Olympics, but DIA's Ashley said nothing has changed about the North's dangerous aims toward its neighbors or the United States. "Decision time is becoming ever closer in terms of how we respond to this," Coats said. "We have to face the fact that this is a potentially existential problem for the United States." Intellectual property theft by China, terrorist groups like ISIS and al-Qaida, and drugs crossing the Southern border from Mexico also came up, but the hearing kept coming back to the broad peril involved with cyberattacks. "Cyber is clearly the most challenging threat vector this country faces," said Senate intelligence committee Chairman Richard Burr, R-N.C. "It's also the most concerning, given how many aspects of our daily lives in the United States can be disrupted by a well-planned, well-executed cyberattack." King complained that the United States doesn't have a formal strategy to deter cyberattackers. Instead, "all we do is patch our software and try to defend ourselves," he said. "We are trying to fight a global battle with our hands tied behind our back," he added. Two FBI-related storylines also continued to pop up: One involved the timeline of former White House staff secretary Rob Porter's resignation. The other involved accusations by Trump and other Republicans that the intelligence community is biased against them. Wray was asked on Tuesday by Sen. Ron Wyden, D-Ore., for a more complete order of events in terms of when the White House knew about domestic violence allegations against Porter as part of his background check process — allegations Porter has denied. The White House has been ambiguous about when senior officials knew about the allegations of abuse by two of Porter's ex-wives, which could have affected his ability to get a full security clearance. Wray said the FBI followed protocol and turned in an initial report in late July 2017. Wray declined to say what was in the report, but he said that his agency received requests for a follow-up and responded to that by November and closed the file in January 2018. That differed from some accounts of events given by the White House. And, as has been the case at many hearings on Capitol Hill in the past few months, Wray also was given the chance to respond to criticism from Trump that the FBI is "in tatters." More recently, the FBI has come under more criticism after the release of a Republican memo that alleged bias against Trump. Wray repeated that he has "grave concerns" about omissions in the memo by Rep. Devin Nunes, R-Calif., chairman of the House intelligence committee, which both the FBI and the Justice Department have denounced. "There's no shortage of opinions about our agency. ... My experience has been that every office I go to, every division I go to, has patriots. People who could do anything else with their careers but they've chosen to work for the FBI because they believe in serving others," Wray said. "I encourage our folks not to get too hung up on what I consider to be the noise on TV and social media."